A used filing cabinet is a cost-effective way to furnish and organize your office. 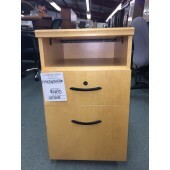 We have a variety of vertical wood filing cabinets in closeout or gently used condition. You can browse through our new filing cabinet inventory as well.